Wondering what this part is. It's below and to the left of the balancing screw. Just wondering what it is and what it does. I'm leaking a small bit of oil from somewhere. It seemed loose so I tightened it up earlier. the engine is off, or being parked overnight or anything. So what is this thing, it will start with it connected or not. Last edited by Wizzle; 06-11-2012 at 08:10 PM. Last edited by wooferdog; 06-11-2012 at 10:37 PM. 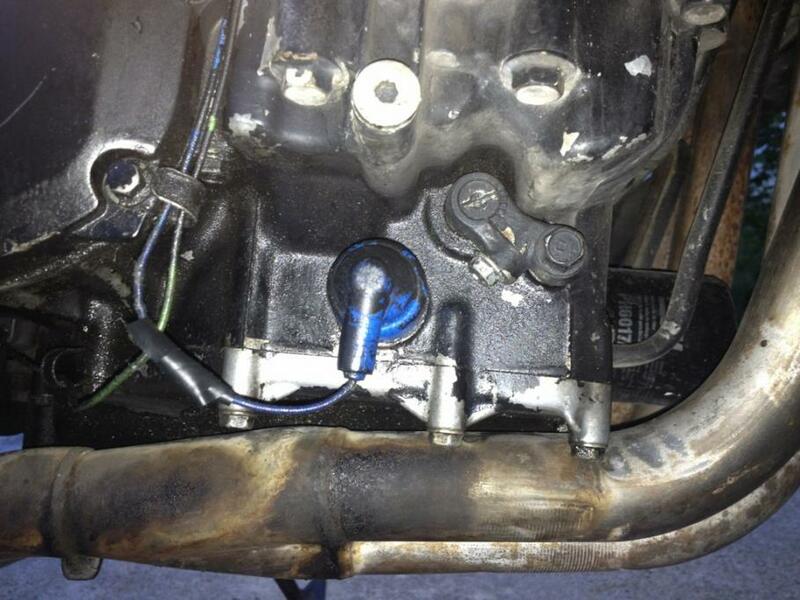 oil pressure sending unit, as stated. to today randomly...it started gushing oil. I mean, leaked 3.5 quarts out on a 20 minute drive. No warning or anything, just started riding and all of a sudden...leak. send the pressure info to the oil light. Since I don't have an oil light, I went ahead and tried to home remedy it. First used some super glue and let it dry for a few minutes. It stopped the leak for the most part, but still dripped some. As of right now, I have some JB Weld drying and curing on it. Will let you know how it holds up tomorrow. pics, just cause I know yall like em. OPSU leaking like a B.
clean it up for surgery. still leaked a few drops so added more glue and dried for a couple hours. now for the real fix. let dry and cure overnight. I'm thinkin that will do the trick. Last edited by Wizzle; 06-20-2012 at 03:03 AM. As you can see in the first pic in the bottom right corner. it spit oil out that far. Bad leak. Smoking pretty good from oil draining onto exhaust. Quick Reply: What is this piece?